I have a lot of photos and we crammed a lot into two (three? four?) days, so I want to split up this post. 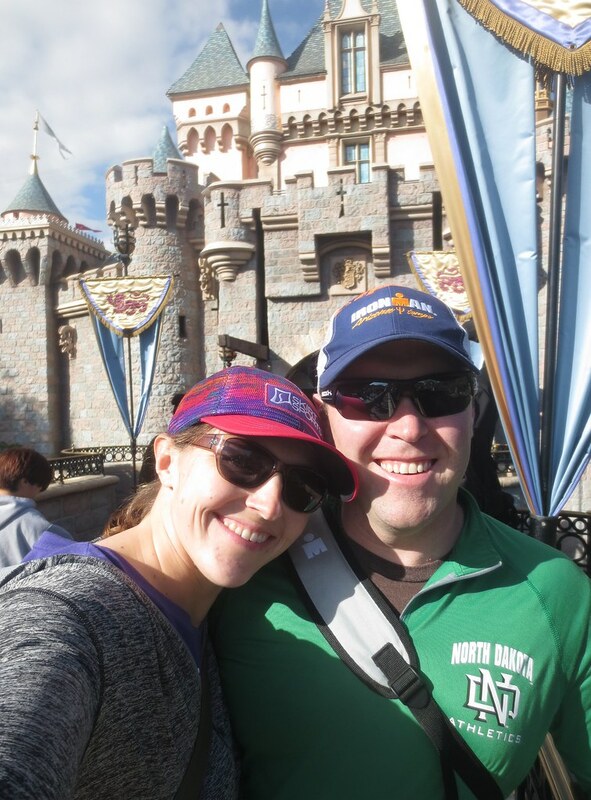 A few months ago, we learned that my brother and sister-in-law were planning on taking their kids to Disneyland in February. 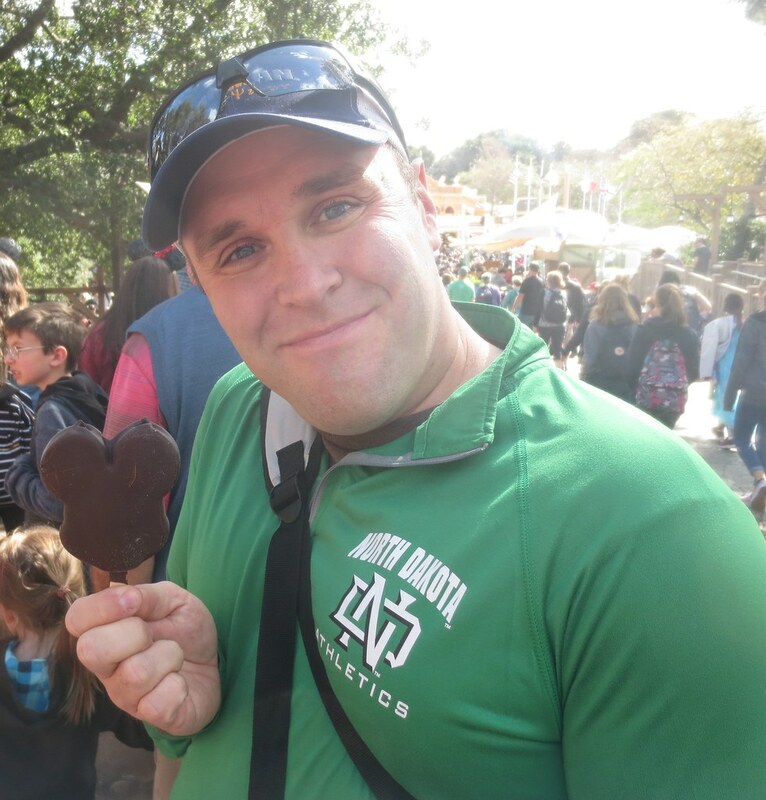 B likes Disney and hadn’t been in about ten years and I haven’t been since the late-1980s. Possibly 1990. A long time ago, in any case. So, with permission, we decided to loosely tag along, since we mostly did our own thing. Thanks to flights the way they were, we had to skip curling Sunday afternoon to catch a flight to LAX. We ate snacks in the Delta Sky Club (I pretty much ate lunch thanks to some salad-y type stuff) before picking up his car and driving to Anaheim. We stayed at the Anaheim Marriott, right near the Convention Center (less than a mile away from Disney). We considered going out to dinner, but decided to do it on the cheap thanks to the schmancy lounge at the Marriott having really delicious chicken wings. A stop at Target was made that evening, however, for some Dramamine so we didn’t vomit everywhere. We woke up early on Monday, February 12, so we could get in a quick run. Breakfast was at aforementioned schmancy lounge in the Marriott. Brandon got coffee at Coffee Bean and Tea Leaf while I decided to wait for Starbucks until we got in the park … not realizing that the ‘Bux I wanted to hit up was actually in Downtown Disney. Oops. As a result, I didn’t caffeinate myself until late morning (when I found the licensed store on Main Street). 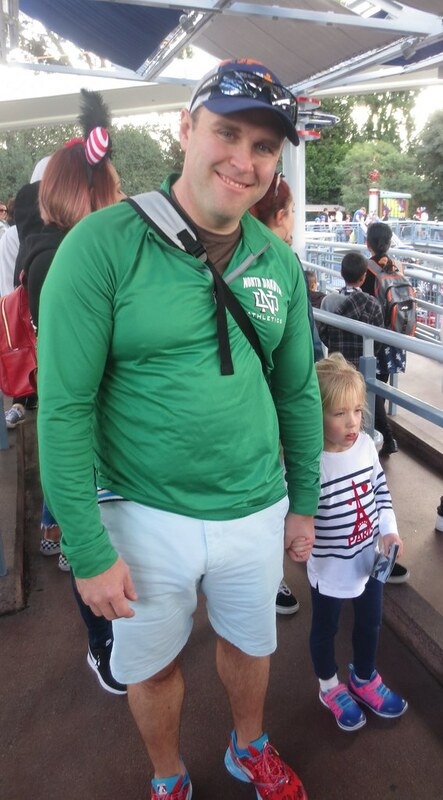 We met up with my brother and his family as soon as we entered the park. 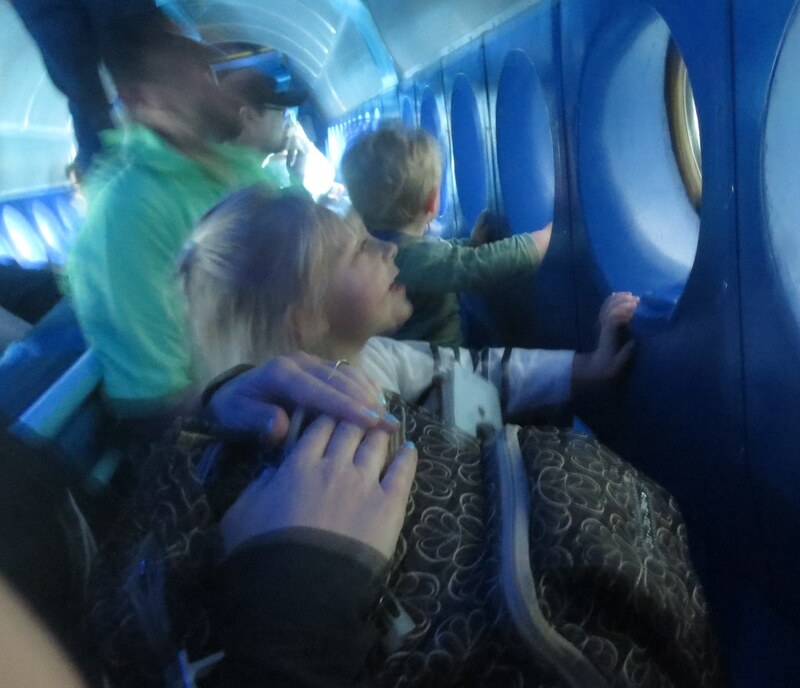 We all agreed to buy FastPasses for Space Mountain, but first, we went on Finding Nemo Submarine Voyage. I vaguely remember this ride from way back in the day when it was 20,000 Leagues Under the Sea-themed and it had the scary squid of doom try to eat the Nautilus. I think I liked it better then, too. The loose “plot” of this ride … didn’t work. Post-ride, we hit up Space Mountain (otherwise known as the first test of the Dramamine). 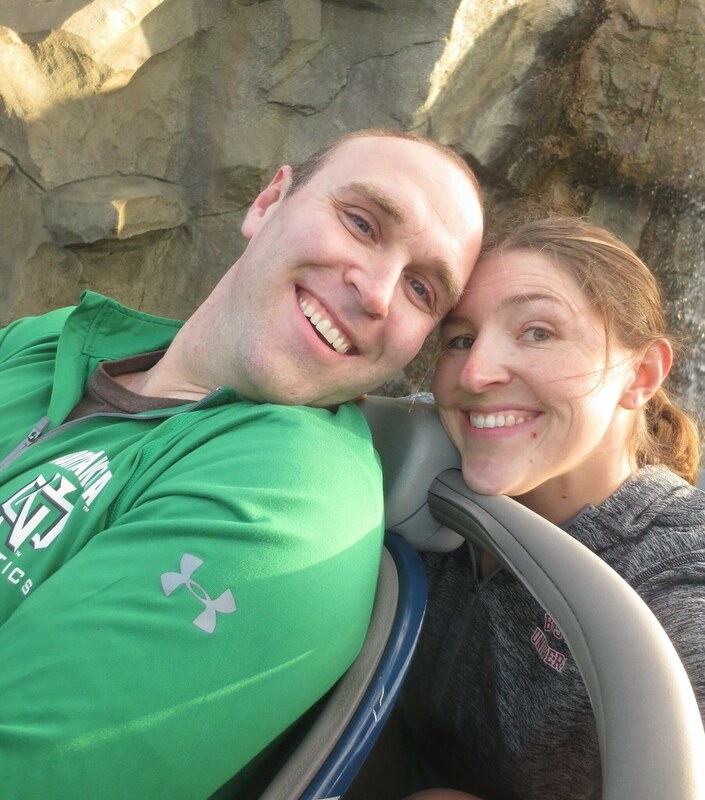 B and I went on it first – no nausea! woo! dizziness, though … – and then watched Jax while Amelia and the parents rode. 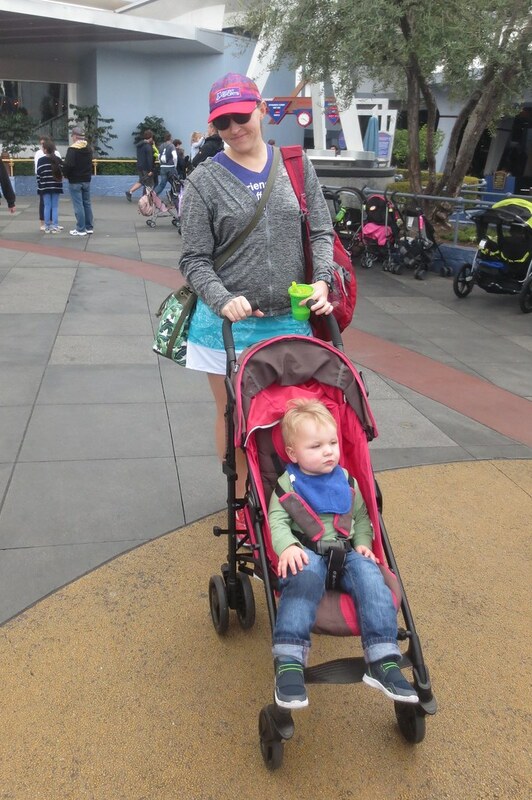 … I’m pushing around a stroller. This will never be my future. Unless I’m borrowing other people’s kids. Like I am here. 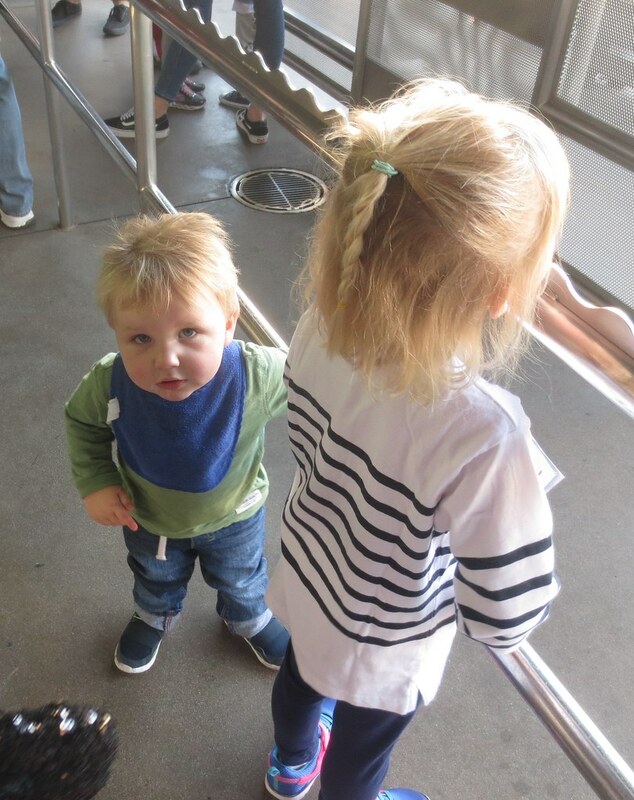 Afterward, Stefan and Nicole took Jax over to Toontown to get in line for characters because Amelia wanted to ride with B on Autopia. Autopia was okay. Would have been better without other people (that is, the other idiots on the road/track). We walked Amelia to Toontown to dump her off with her parents and then wandered off to find me some coffee. Saw the Mad Tea Party (i.e. 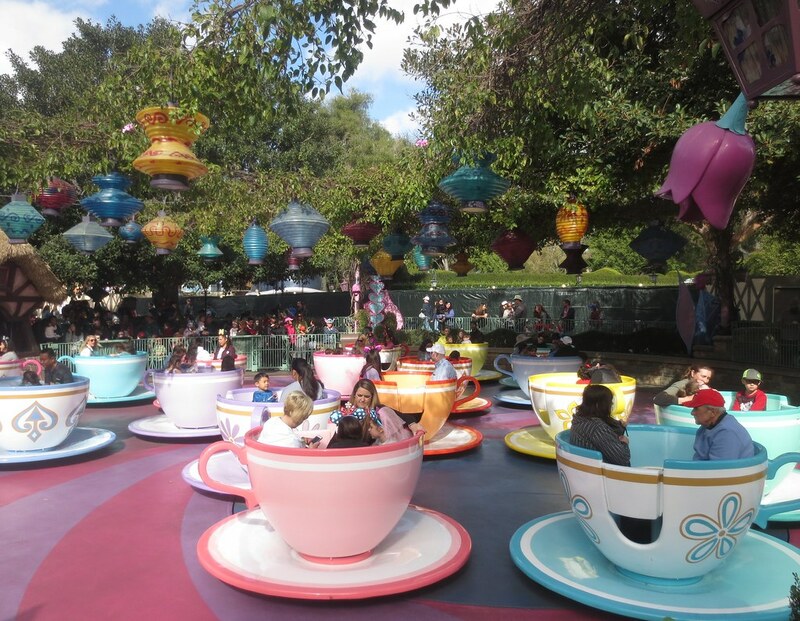 Tea Cups) on the way. Did not ride. Did not want to test the limits of the Dramamine. They looked pretty, though. Stopped at the Market House (which has a licensed Starbucks inside) for some much needed caffeine (that is, iced coffee) and a cheese danish. I think B got extra coffee too. We then stopped at the Jolly Holiday Bakery Cafe for more food. It was technically past 10:30 (like 10:37) and therefore officially lunchtime, but they still had bacon, egg, and cheese croissants on display, so we bought one and split it. It was food. That’s all I’ll say about that. Our next FastPass was for the Haunted Mansion, but I’m pretty sure we walked through Tarzan’s Treehouse on the way there (another thing I vaguely remember from back in the day … when it was Swiss Family Robinson themed and WAY COOLER). Haunted Mansion was much like I remembered it. Pirates of the Caribbean didn’t have a FastPass, but we decided to wait in the line for it anyway. It has been redone to be heavy on the Jack Sparrow, but there’s still some “questionableness” to it with the wench/wife auction bit. Makes me happy they didn’t completely overhaul it. At that point, our FastPass for Big Thunder Mountain Railroad was just about ready, so we walked over there and met up with Nicole who was sitting with Jax waiting for Stefan and Amelia to ride. While chatting, B got a Mickey Bar. Damn things are frozen solid. Ride wasn’t bad. Kind of disappointed there were no cameras to take pictures on it. We knew we needed more food, so we wandered around looking for it … stopping at Frontierland Shootin’ Exposition on the way. It’s one of those cheesy shooting gallery things that costs 50 cents … but we enjoy them (and I’m actually pretty good at it), so we stopped and spent the dollar. We split (okay, B more ate) a hot dog and chips from the Refreshment Corner and then a root beer float (one of the best deals at any theme park) from the Gibson Girl Ice Cream Parlor. We also took this opportunity to sit for a moment. Food eaten, we finally did B’s favorite ride ever, Buzz Lightyear Astro Blasters. When he visited with his parents back in 2009, he kept emailing me photos from the ride. I crushed it (and him), beating him by like 30,000 points. He was stunned. And happy, yet annoyed. I think his parents were secretly happy about this. Since I didn’t get to really see Mickey’s Toontown earlier, we walked up that way next to explore it, walking through Chip ‘n Dale Treehouse and then wander around a bit until our next FastPass was ready. In front of Sleeping Beauty’s Castle. 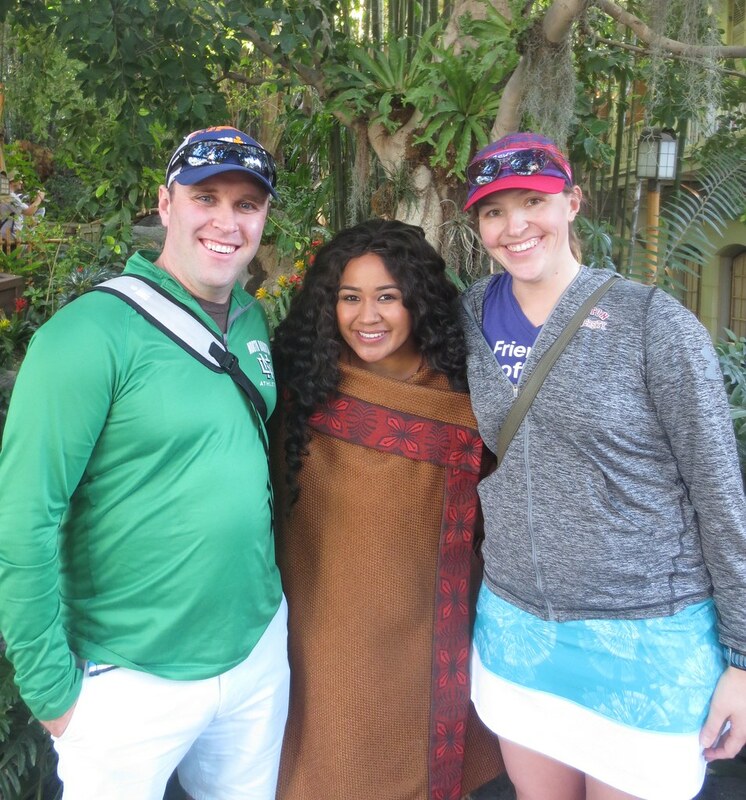 B wanted to meet Moana, so we met Moana. 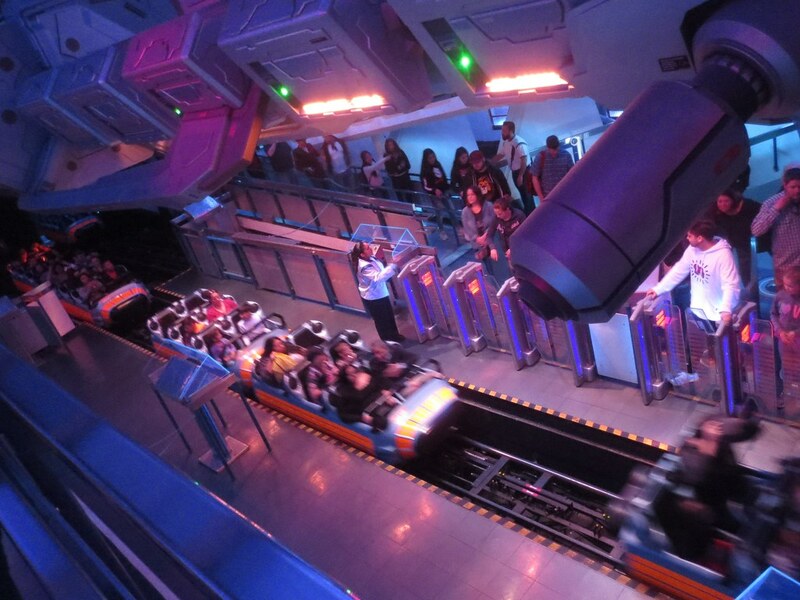 Our next FastPass was for the Matterhorn Bobsleds. Fun ride … yetis inside the mountain were definitely creepy … and it broke down on us, right before the finish. It was actually nice to just chill for a second, we were right near the waterfall, good ambiance … it wasn’t bad. Being stopped meant I could take pictures of us. Thanks to the ride breaking down, we got another FastPass to use at almost any ride, so we decided to use it for Indiana Jones Adventure (so ride it at 5pmish as opposed to our 8pm scheduled FP time). we quickly saw the family and learned that poor Nicole was dying, so they skipped their dinner reservations and made it an earlier night so they could get in a second day okay. We got in line … and right afterward … the ride breaks down. We had the option to hang out and wait for it to reopen, so we decided to do that. 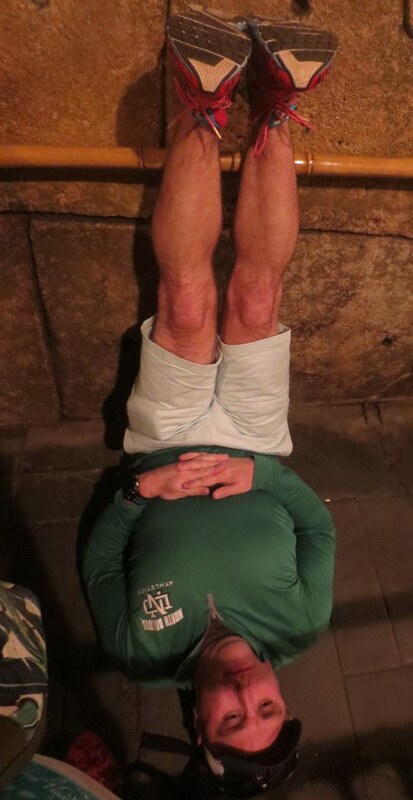 I was checking the Beanpot score while I had reception and B decided to do some yogic legs up the wall to stretch out. We ended up averaging about 28,500 steps each day, so this was a lifesaver for him. The ride was actually really fun and I do love me some Indy. Afterward, we went on the Jungle Cruise (which is apparently better at night) … it was okay. So many one-liners. I hear Dwayne “The Rock” Johnson is in talks to redo it and I’m excited to see what it will turn into. At this point, we really wanted actual food (not just snacks) and I wanted to try to watch the final bit of the Beanpot (despite BU sucking), so we exited the park and went to the ESPNZone in Downtown Disney (and saw the two Starbucks). I couldn’t get the Beanpot on TV (fail. but given how it went …), but got a beer and ACTUAL FOOD OMG (cobb salad). We finished, walked outside … and lo and behold, it was raining. 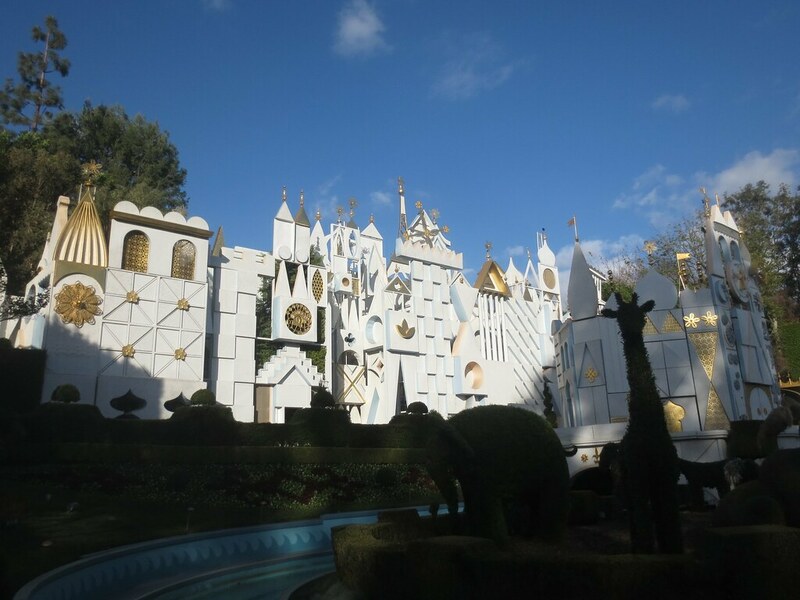 We weren’t quite finished yet, so we hopped the Monorail back into the park pretty much just so I could ride It’s A Small World. Mostly the same as I remember it, except it’s been updated with actual Disney characters tossed in when appropriate (like Lilo and Stitch in the Polynesian area). It also had a creepy Mountie, which was hysterical. It wasn’t as crappy as I remembered, but this could also be because we made snarky comments about everything? Who knows. 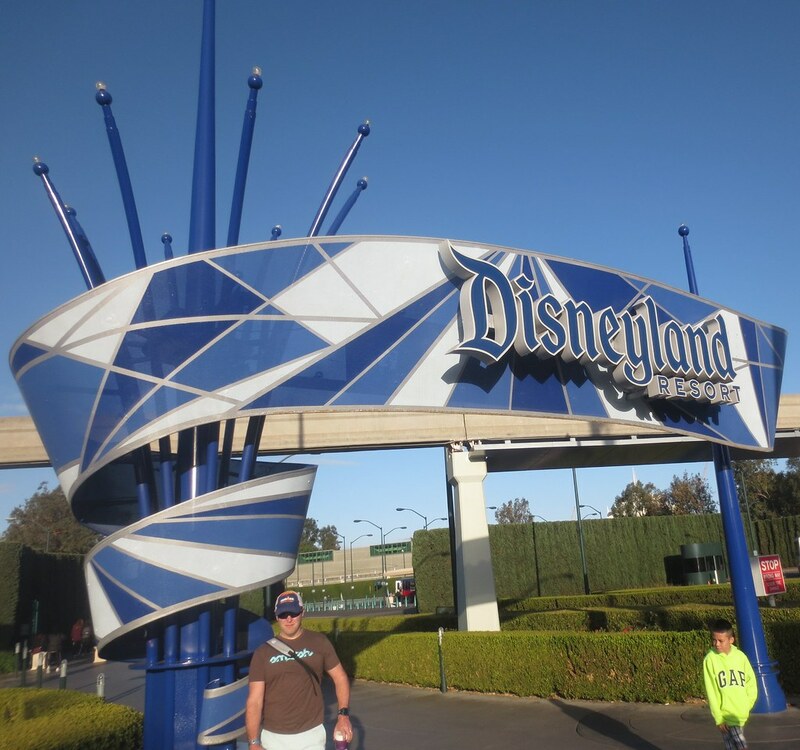 I’ll end this here, and come back next time with day two … which was a touch of Disneyland and a lot of California Adventure!